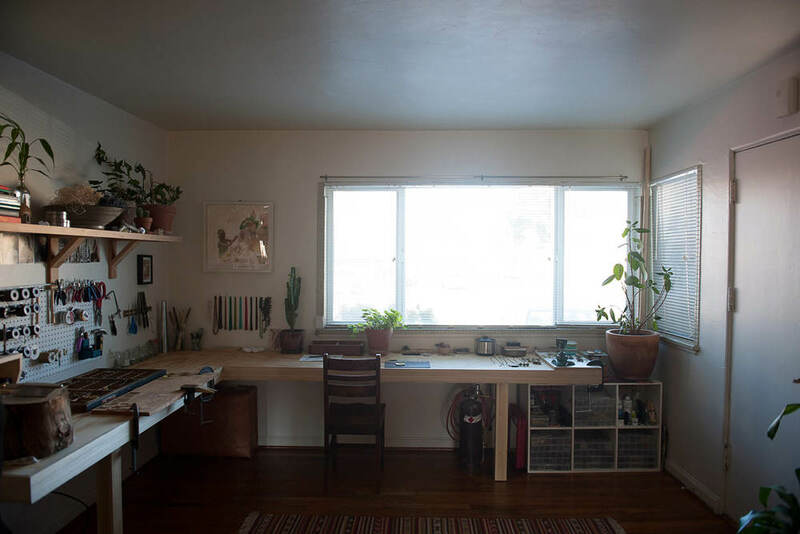 Studio Visit: LunaSol — Portland Supply Co.
Lindsey Alonzo graciously welcomed us into her home studio with a warm smile, a very organized jewelry bench and tons of happy plants in her southwestern inspired haven. LunaSol is Alonzo’s line of intricately handcrafted brass and fiber jewelry. Her hispanic heritage shines through her work drawing inspiration from Mexican as well as Native American patterns and technique. We love that Lindsey’s background in textiles is reflected in LunaSol. 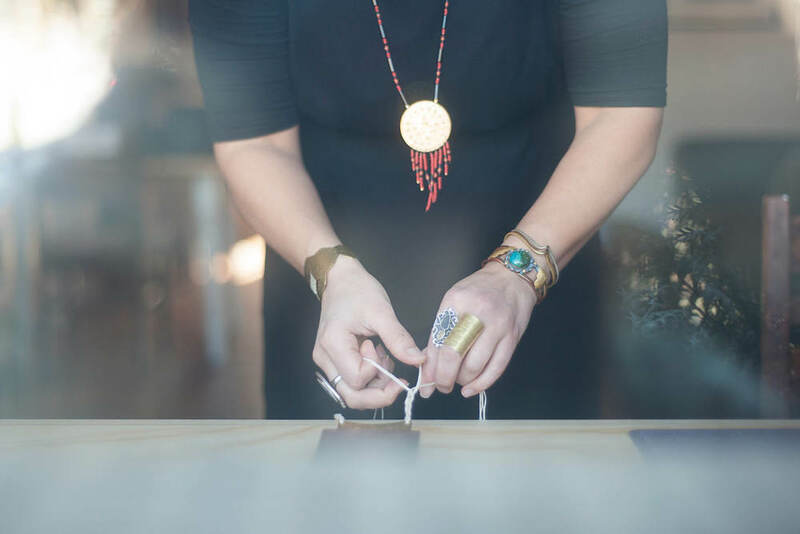 She uses fibers beautifully in her work, from thin braiding used as chain to accenting pops of color on her hand cut pendants. Our absolute favorite piece of hers is the Toya Cuff; it’s just too good! Having grown up in Kansas and vacationing on the west coast, I always knew I wanted to live out here. I gave Berkeley a try but it didn’t end up working out, so I came to Portland where a few of my friends had already relocated. I didn’t think I would love it as much as I do. The longer I live here, the more I love and appreciate it. The only thing it’s missing is thunderstorms. There are so many great things happening in Portland, it’s hard to keep up! Whether it’s a new restaurant, a new store or a new artist I find out about, it keeps me interested and always inspired. I also love that there are so many designers and artists in this town who are making a living doing and creating what they love. My brand kind of started by accident. I went to college for Textile Design because I wanted to be a clothing designer. I was working for a boutique dying and designing clothes when jewelry making was introduced to me. The owner of the store started buying beads to sell and having classes on basic beading so I signed up for one. It didn’t take long before I had more interest in jewelry and gemstones than clothing. Before I knew it I was teaching classes and making one-of-kind jewelry for the store. I eventually began creating and selling my own work under the name Luna Sol Designs. That was about 12 years ago, and only within the last few years have I started to take it more seriously with hopes of making it a career. My biggest obstacle has always been trying to juggle my daytime jobs while creating jewelry part time on the side. I’ve always felt like I could never get LunaSol to take off while working 40 hours a week doing something else. It took me about 10 years to finally take the leap and quit my 9-5 to pursue this full time. It’s stressful at times, but I’m super happy I did. The other obstacle would be time management. But that’s a story for another time. 5. Who is your style icon(s)? I don’t think I really have a specific style icon. I like anything that draws from indigenous costume that can be incorporated into modern day wear. Things like a beautifully embroidered Mexican blouse, a Guatemalan Huipil or a print with a Pendleton pattern on it. All the indigenous women of the world with their colorful clothing and big, beautiful jewels are icons to me. Ooh, so many favorites. I love how progressive it is. I like the big city/small feel it has to it. I really enjoy hanging out in all the pockets of cute neighborhoods, indulging in the delicious restaurants and taking advantage of the amazing nature that surrounds us. It is a very inspiring place to live with so many like-minded people creating and making beautiful things. 7. What neighborhood describes your style the best? Since moving here almost 7 years ago, I have only ever lived in one neighborhood... No; I have moved 3 times and each house has been within a 10 block radius of the other. So really this is the only neighborhood I can see myself in. A lot of my favorite places are an easy walk or bike ride away. My workspace isn’t ideal being in my apt, but it is really nice to wake up, make some tea and walk into the living room to start working. I can’t decide if I would be better off having to drive somewhere to get myself out of the house of not. I am fortunate to have a very talented boyfriend who basically did a small build out in my apt for a new and improved workspace. 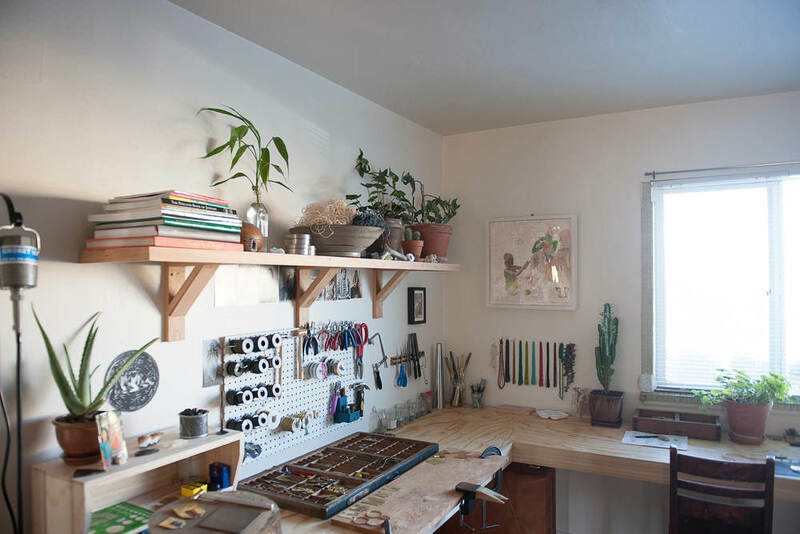 I absolutely love the work table he made. It’s the perfect size for me to spread out and make a mess. It sits nicely in front of a big window so I finally have natural light beaming in on me.